Registration and Contest Details are below! 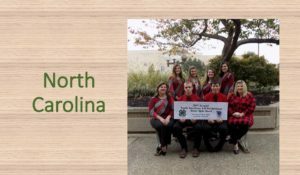 The NC 4-H Dairy Quizbowl State contest is typically hosted in the Spring and brings together 4-H youth clubs and FFA chapters from all over the state. The Dairy Quizbowl tests youth knowledge on matters relative to dairy production, dairy foods, and dairy industry/organizations through a written test as well as lightning question rounds. Read below for more details about how the contest works and where you can find more resources. Most quizbowl teams have 4 members with up to 2 alternates. All members of the team take the written exam, but only 4 members compete in the team question and toss up rounds. After the written exam, teams are seeded and the competition begins with team questions. After team questions, toss up questions are asked and individuals can buzz in to answer. Rounds continue until a winner is chosen. In addition to the moderator, judges are present to address any issues that arise relative to the questions, answers, and general contest rules. Each team member completes the written exam, which typically consists of 50 questions. The results of this exam are used to seed teams for the next phase. Often, the teams with the greatest score will start against teams with the lowest score. Teams with high scores may be able to earn a ‘bye’ into the next phase, depending on the number of teams participating. In addition to seeding, specific questions on the exam will be chosen at random to assign points to the team’s score. Each round, a set of 5 questions will be chosen and each question will be worth 5 points, so the team can earn a total of 100 points (4 teams members x 5 questions x 5 points/question). In Phase B, each team is asked 5 questions of greater difficulty. Because each team is asked the same 5 questions, one team will leave the room. Team members may confer with each other and the answer is delivered by the team captain. Teams have 20 seconds after the question is asked to begin their answer and must complete their answer in 60 seconds. Each question is worth 10 points and partial credit may be given at the discretion of the judge(s). During Phase C, a total of 20 questions are asked. Team members must answer individually, and no conversation is allowed. The first contestant to buzz in (or signal the moderator) will have 10 seconds to being their answer. Contestants are usually penalized if they answer without being recognized by the moderator first. It is also important to note that if a contestant rings in before the question has been fully read, the moderator will not complete the question. If the answer is incorrect, the other team will have an opportunity to answer the question. The can also hear the question in its entirety. In most cases, bonus points can be earned by answering a pre-determined number of question correctly (i.e. 3 or 5 in a row correct will earn you a bonus question). In this phase, questions are worth 15 points. There are many resources available for preparing for the Dairy Quizbowl. Most University extension websites have practice questions. Practice questions for NC can be found here. Additionally, breed associations like Holstein Foundation also have resources for teams to study. You can learn more about the National 4-H Dairy Quizbowl, which happens annually at the North American International Livestock Exposition. The winning Senior Division team from North Carolina is invited to travel, along with their coach and extension agent, to NAILE to compete in the National 4-H Dairy Quizbowl. This trip is supported, financially, by the NC Dairy Youth Foundation. You can learn more about the NC Dairy Youth Foundation here. Dairy farms and farmers have been a strong part of North Carolina’s Agriculture Industry. While it may be smaller than some other areas of the United States, the NC Dairy Industry is made up of progressive and sustainable family farms, which we are happy to serve. Our Dairy Extension program focuses on bringing current industry management practices and future technology to our dairy farms in NC to help them maintain their way of life. We offer expertise in cow and youngstock management, farm finances and business management, nutrition, reproduction and breeding, waste management and any other general issues that our farmers face. We partner with other industry organizations to make sure our dairy farmers have access to outstanding education and training programs. Because of these partnerships, we also have an excellent dairy youth program, giving young people the opportunity to learn about dairy all over the world and in their own backyard. We offer programs in cattle evaluation and judging as well as leadership development opportunities through 4-H and FFA programs.